The Montanas Negras Walk, or the walk of the Black Mountains, is a relatively easy one, because there isn't much actual climbing involved. You first get yourself to the village of San Jose de Los Llanos, just north of Santiago del Teide. The only TITSA bus I can find to take you there from the southern resorts is the 460, leaving Playa de Las Americas at 9:35am, 12 noon, 1:55pm, 3:55pm, 6pm and 8pm. This only goes to the region of El Tanque and you have to get off at a stop called, according the the TITSA website, "P Morales". From there, you have to walk through El Tanque and on to the small village of San Jose de Los Llanos. To access the Montanas Negras walk in a car, you take the coast road (TF-47) out of Las Americas as far as it goes. Eventually, the road bears to the right (signposted Tamaimo, Santiago del Teide) and becomes the TF-454. Stick to this winding road till you reach Tamaimo. There'll be a T-junction, with a sign indicating, amongst other things, Santiago del Teide to the left. Take this turn, which brings you onto the TF-82. You're on this for quite a while, passing through Santiago del Teide. Watch out for the sign for TF-373, off to the right. Follow this, again watching for the sign for Los Llanos that'll take you into the small village, where you can park. 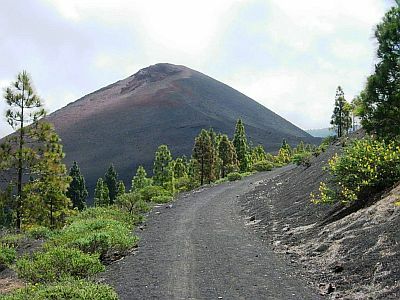 The Montañas Negras are so-called because, like a lot of Tenerife, they are formed from black, volcanic rock. Part of this mini-range is the Volcano of Garachico which erupted with such force in 1706, that it destroyed almost completely the town that bears the same name. Anyway, you take the forest trail out of the small village of San Jose de Los Llanos and initially head south, towards Montaña Bilma. The route then takes you eastwards, where the track runs alongside a canal called Vergara. This was used to carry water from the verdant and rainy north of the island to the more barren south. These days, it is as much likely to be dried up as anything, but, as the trail sticks to it, you have it as a companion for quite a bit of this walk. Weather permitting, you should already be afforded great views of Santiago del Teide and its surrounding valley, plus, as you proceed along the track hugging the canal, there'll be superb views of the solidified lava flows from the most recent eruption of the Chinyero volcano, in 1909. The trail eventually turns northwards and you'll come across a signpost, clearly indicating the way to the Area Recreativa Arenas Negras. This is a campsite with a picnic area and is a good place to stop for a rest and a snack (if you've had enough foresight to bring some sandwiches). At this point, you are very near Garachico Volcano and there should be amazing views, not only of this, but back towards Mount Teide and its smaller neighbour Pico Viejo. Now it is the last leg of the walk and this is a pleasant interlude descending through pine forests, aiming for the return to your starting point.